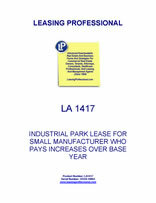 This lease is for a small industrial tenant with a manufacturing operation occupying space in an industrial park. The tenant is responsible for base rent, plus increases in common area maintenance costs, insurance ant taxes over the base year costs for such items. This Basic Terms Sheet to that certain Standard Commercial Industrial Lease between the parties listed below is for the convenience of the parties in quickly referencing certain of the basic terms of the Lease. It is not intended to serve as a complete summary of the Lease. In the event of any inconsistency between this Basic Terms Sheet and the Lease, the applicable Lease provision shall prevail and control. 1. PARTIES. This Lease, dated _____________ for reference purposes only, is made by and between Landlord and Tenant. 2. PREMISES. Landlord hereby leases to Tenant and Tenant leases from Landlord for the term, at the rental, and upon all the conditions set forth herein, the premises demised by this Lease, located at __________________________ (the "Premises"), together with a nonexclusive right to use the unreserved parking spaces and common areas (collectively, the "Common Areas") surrounding the Premises and within the project commonly known as ____________________ INDUSTRIAL PARK (the "Project"). The location of the Premises and the parameters of the Common Areas and the Project are shown on Exhibit "A" attached hereto. All dimensions and areas quoted herein or in any exhibit attached herein are approximate and are based on gross rentable area, rather than solely on areas designed for the exclusive use and occupancy of tenants. 3.1 TERM. The term of this Lease shall be for a period of ___________ (___) months, commencing on ______________ ("Commencement Date") and ending on ________________ (the "Expiration Date"), unless sooner terminated pursuant to any provision hereof ("Term"). 3.2 DELAY IN COMMENCEMENT. Notwithstanding the Commencement Date, if for any reason Landlord cannot deliver possession of the Premises to Tenant on such date, Landlord shall not be subject to any liability therefore, nor shall such failure affect the validity of this Lease or the obligations of Tenant hereunder or extend the Term hereof, but in such case Tenant shall not be obligated to pay rent until possession of the Premises is tendered to Tenant; provided, however, that if Landlord shall not have delivered possession of the Premises within sixty (60) days from the Commencement Date and such delay is absent of force majeure or otherwise, Tenant may, at Tenant's option, by notice in writing to Landlord within ten (10) days thereafter, cancel this Lease, in which event the parties shall be discharged from all obligations hereunder. If Tenant occupies the Premises prior to the Commencement Date, such occupancy shall be subject to all provisions hereof; such occupancy shall not advance the Expiration Date, and Tenant shall pay rent from its date of occupancy at the initial monthly rates set forth below. If Landlord, by reason of force majeure or otherwise, cannot deliver the Premises within ninety (90) days from the Commencement Date, Landlord or Tenant may, at their respective options, by notice in writing within ten (10) days thereafter, cancel this Lease. In the event Landlord is required to improve the Premises as described on Exhibit "B" attached hereto, Landlord agrees to use reasonable diligence to have the Premises ready for occupancy on or before the Commencement Date. The Monthly base rental due hereunder shall be payable to Landlord by the first day of each month during the Term at the address stated herein or to such other persons or at such other places as Landlord may designate in writing and shall be paid in lawful money of the United States of America. The Tenant further agrees to pay Landlord, in addition to the rent as provided herein, all privilege, sales, excise, rental and other taxes (except income taxes) imposed now or hereinafter imposed by any governmental authority upon the rentals and all other amounts herein provided to be paid by the Tenant. Said payment shall be in addition to and accompanying each monthly rental payment made by Tenant to Landlord. The base rental set forth in this Section 4.1 is a negotiated figure and shall govern whether or not the actual gross rentable square footage of the Premises is the same as set forth in Paragraph 12 hereof. Tenant shall have no right to withhold, deduct or offset any amount from the base monthly rental or any other sum due hereunder even if the actual gross rentable square footage of the Premises is less than that set forth in Paragraph 12. Rent for any period during the Term, which is for less than one month shall be a pro rata portion of the monthly installment. 4.2 OTHER CHARGES. In addition to monthly base rental, all other charges or amounts required to be paid by Tenant under any provision of this Lease shall be considered additional rent. All correspondence, notices, and other communications matters should not be mailed to the above lockbox and should be mailed per the addresses presented herein under paragraph 17.8. 5. SECURITY DEPOSIT, CLEANING, RE-KEYING AND INSPECTION FEE. 5.1 SECURITY DEPOSIT. Tenant shall deposit with Landlord upon execution hereof ________________ DOLLARS ($__________) as security for Tenant's faithful performance of Tenant's obligations hereunder. If Tenant fails to pay rent or other charges due hereunder, or otherwise defaults with respect to any provision of the Lease, Landlord may use, apply or retain all or any portion of such deposit for the payment of any rent or other charge in default or for the payment of any other sum for which Landlord may become obligated by reason of Tenant's default, or to compensate Landlord for any loss or damage which Landlord may suffer thereby. If Landlord so uses or applies all or any portion of such deposit, Tenant shall within ten (10) days after written demand therefore deposit cash with Landlord in an amount sufficient to restore such deposit to the full amount hereinabove stated, and Tenant's failure to do so shall be a material breach of this Lease. Landlord shall not be required to keep such deposit separate form its general accounts. If Tenant performs all of Tenant's obligations hereunder, such deposit, or so much thereof as has not therefore been applied by Landlord, shall be returned, without payment of interest or other increment for its use, to Tenant (or, at Landlord's option, to the last assignee, if any, of Tenant's interest hereunder) within fifteen (15) days of the expiration of the term and after Tenant has vacated the Premises. Any mortgagee of Landlord, purchaser of the Project, or beneficiary of a deed of trust, shall be relieved and released from any obligation to return such deposit in the event such mortgagee, beneficiary of deed of trust or purchaser comes into possession of the Premises by reason of foreclosure or trustee's sale (including deed in lieu thereof) or proceeding in lieu of foreclosure unless such deposit shall have been actually delivered to such mortgagee, beneficiary of deed of trust or purchaser. Such release, however, shall not relieve the person or entity that owned the Project immediately prior to acquisition of title by such mortgagee; beneficiary of deed of trust or purchaser of any obligation he or it may have to return such deposit. 5.2 CLEANING, RE-KEYING AND INSPECTION FEE. In addition to the security deposit provided for in Section 5.1, Tenant shall deposit with Landlord upon execution hereof _________ DOLLARS ($_______) as non-refundable fee to compensate Landlord for typical cleaning, re-keying, and inspection fees that Landlord will incur upon the expiration or earlier termination of the Term (the "Cleaning, Re-Keying And Inspection Fee"). The Cleaning, Re-Keying and Inspection fee shall be earned by Landlord upon receipt and shall not be subject to adjustment regardless of whether Landlord's actual cleaning, re-keying and inspection fees differ from the fee paid by Tenant.